It's finally here! We've been waiting all winter to experience the delight of outdoor living again. We've taken the patio furniture and umbrella out...the plants and flowers are starting to embrace our outdoor space. And now it's time to reintroduce those very special summer foods, especially some of the wonderful sea delights that are more readily available at this time of year! So to start the season, why not serve baked stuffed clams on the half shell?—a perfect hors d'oeuvre to accompany cocktails—or serve as an appetizer for the first course. Seem complicated? It's actually easier than you think! The clams are already prepared, seasoned with bread crumbs and herbs and they come frozen, ready to pop in the oven. And they're fabulous! Who's responsible for this brilliant idea? Sally's Fish Market in Newburgh, NY. The clams are from Long Island and like all of Sally's fish, there's a daily pickup for the freshest at the Fulton Fish Market at Hunt's Point in NYC. To prepare, just preheat your oven to 325 degrees. Place the clams in a cast iron skillet or baking dish. Drizzle some olive oil on the clams. Bake for approximately 35 minutes. Remove from the oven and serve with lemon wedges. 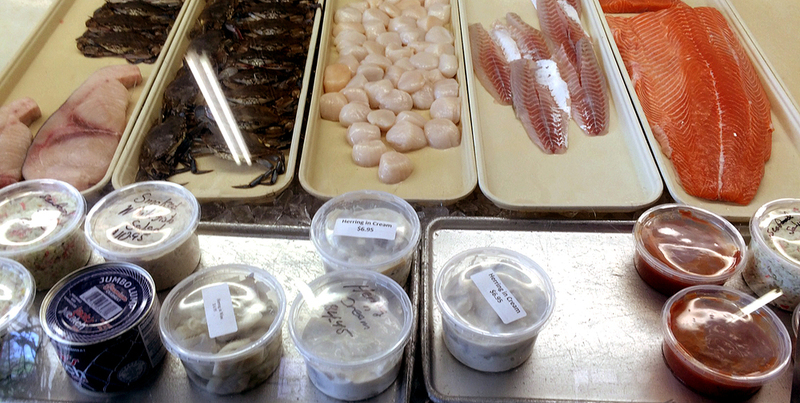 In addition to these prepared clams, Sally's also offers in their frozen department: shrimp, New Zealand mussels, king crab legs, lobster tails, cooked scungilli and containers of chopped clams and clam juice perfect for pasta with clams. All of these items are cleaned, bagged and ready to cook. And we can't overlook the daily assortment of fresh fish that Sally's has provided for over 80 years, 5 days a week, to Newburgh and the surrounding Hudson Valley area. To ensure quality and freshness, Sally's only provides seafood in season. 20% of Sally's business serves the restaurant trade; the balance caters to retail customers and catering. If you have a large enough group, they would love to put together their infamous Clam Bake for your next party. Last but not least, the shop is impeccably clean and the owners and staff couldn't be more accommodating or friendly. Newburgh and the surrounding Hudson Valley are so lucky to have them in the neighborhood!